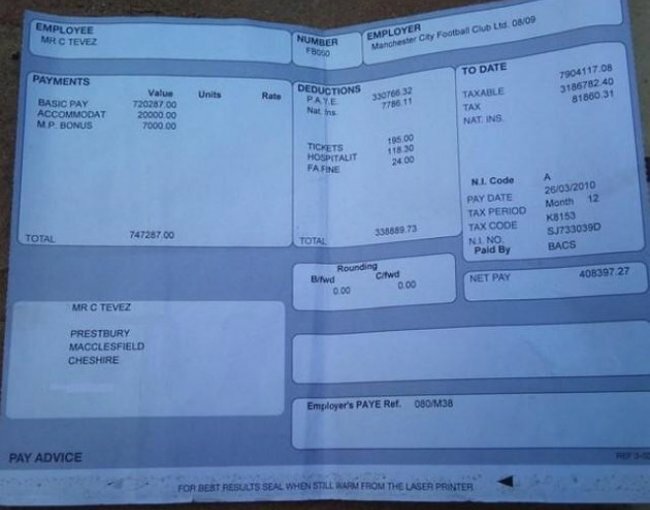 One such man is Carlos Tevez, who is the apparent owner of a payslip that leaked on Twitter on Sunday. Assuming the document is genuine, it tells us that the Argentinian earned a gross wage of £720,287 in March 2010, with an additional bonus of £20,000 for accommodation — it really is impossible to find anything in Manchester for any less — and a £7,000 “M.P. Bonus” (presumably, Tevez is given a monthly reward if he is able to resist storming off to play golf for indefinite periods of time). It also reveals that the City striker’s net £408,397.27 earnings were hampered by a whopping £24 fine from the FA, which was probably handed down for a yellow card. In the tax year 2009/10, the payslip tells us that Tevez was paid just under £8m, but handed over nearly £3.3m in tax and national insurance. The incident happened in the 17th minute of Huracan’s Torneo 6 Ligas cup fixture with Club Jorge Newbery earlier this month. Schiavi, whose older brother Rolando plays for Boca Juniors and the Argentina national team, became incensed when he was sent off for what looked a fair challenge. But instead of taking his punishment like a man, Schiavi and his colleagues, who were losing 2-0 and facing an early exit from the tournament, began a confrontation with referee Dario Fuene that quickly turned ugly. Indeed, several Huracan players escalated their verbal berating of the man in black into a full on shove contest, before one wrestled Fuenes to the ground. As the referee tried to get up, Schiavi strode over and promptly kicked Fuenes in the head, in what has been described as the worst attack on a match official ever. The brother of Boca Juniors star Rolando Schiavi, Leandro Schiavi, has upstaged his sibling for all the wrong reasons after he was filmed brutally assaulting a referee in an amateur match in Argentina. The incident occurred as Hurricane Arribenos beat Jorge Newbery 2-0 in the past few days. The action started when referee Darius Funes went over to check up on a Jorge Newbery player who was lying flat on the ground. Seconds later Leandro Schiavi, wearing Hurricane Arribenos’ green number 2 jersey, appeared on the scene, and he immediately tried to drag his fallen opponent to his feet in a gesture which suggested he though the Newbery man was faking. Within a blink of an eye a group of players from both sides piled into the mix and the pushing and shoving began. Schiavi was sent off in the aftermath, but that only served to kick matters off in a far more dramatic fashion. The Facebook page of Jose Sislema Merello has leaked a new angle of a famous paratrooper who dropped on Taca Bieler. After doing a stunt in the air and crossed with a partner, looking paratrooper landing, having the misfortune to fall on to Bieler.